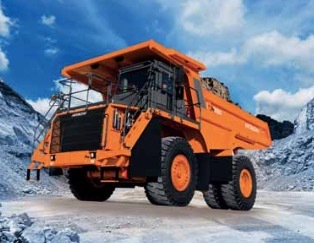 Hitachi Construction Machinery Co., Ltd (HCM) has obtained the licence for camera image processing technology — jointly developed by Nissan Motor Co., Ltd and Clarion Co., Ltd. — for use in its rigid dump trucks and ultra-large mining excavators. The multi-camera Around View Monitor (AVM) and Moving Object Detection (MOD) technology offer excellent visibility and alert operators to movement on job sites. The AVM offers an overhead view of the machine’s surroundings in real time by composing images from four exterior cameras. The monitor installed in the instrument panel displays the position of the machine and lines to assist parking. Based on the AVM technology, which is already installed in Nissan cars, HCM has developed an overhead- view monitor with Clarion for use in its dump trucks and mining excavators. The MOD technology analyses images of moving objects from the four AVM cameras. It enhances safety by alerting the driver to any changes in the machine’s surroundings. Using the MOD significantly improves the operator’s vision of other trucks and machinery in the mines. Safety on the job site is a top priority for customers and a key development theme for HCM. The company incorporates advanced technologies from other Hitachi Group companies and other industries — particularly the automotive sector — in its own technologies to create products with enhanced safety features. HCM will make further endeavours to provide products that contribute to safety by developing the overhead-view monitor equipped with MOD, by exploiting benefits of the licensed technology.